Rendering of Memorial Green development by Midway. Construction of the commercial space in the project will be complete in early 2017. 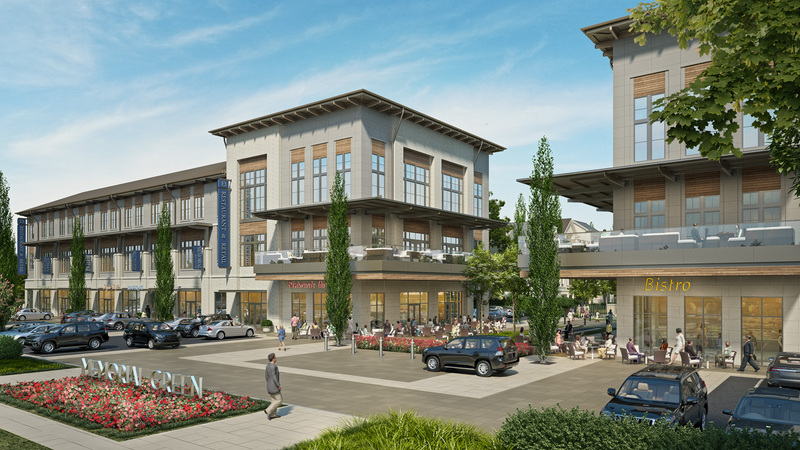 HOUSTON – Midway, a Houston-based real estate development and investment firm, has signed six commercial tenants in Memorial Green, an upscale village of custom homes, shops and office space on Memorial Drive in west Houston. Memorial Green will feature 91 single-family luxury urban homes, a central green plaza and gated community parks, 50,000 square feet of Class-A office space with an additional 25,000 square feet of boutique retail and restaurants. The 14-acre enclave development, located between Gessner and Beltway 8, is located in one of Houston’s most prominent zip codes, in the heart of the Memorial neighborhood. The new leases, totaling 17,866 square feet, include: Define Body & Mind, Vine Wine Room, Dish Society, Minuti Coffee Stores, Old Republic Title and Heritage Texas Properties. Heritage Texas Properties’ agent Kim Whaley is marketing the homes in Memorial Green, priced from over $1 million to more than $2 million. Construction on the commercial buildings at Memorial Green has begun and is completion is slated for early 2017. Colvill Office Properties handles office leasing for the project. The Memorial Green site was once the location of the Buckner Baptist Haven seniors facility, that was torn down over a decade ago. Founded in 1968, Midway is a privately owned, fully integrated real estate investment and development firm that developed the notable City Centre mixed-use development at Interstate 10 and Beltway 8. The Midway portfolio of projects completed and/or underway consists of 45 million square feet of properties in 23 states and Northern Mexico ranging from mixed-use centers, corporate headquarters, multi-family, entertainment, hospitality, business and industrial parks, and master-planned resort and residential communities.